Pale green in color with aromas of citrus, tropical fruit, and herbs. Flavors of pineapple with a herbaceous and clean finish. Pairs well with shellfish, asparagus dishes, summer salads. Recommendations: On Friday while shopping for groceries, my wife and I also picked up a bottle of the 2009 Kim Crawford Sauvignon Blanc – we had been looking at it for a while when stopping in the store and we have a big lack of white wine in the house at the moment. On Sunday we opened it up to pair with a dinner of bacon wrapped scallops and butter noodles. If I had to pick two words to describe this wine it would be “green” and “citrus”. On the nose the tropical fruits and citrus were prevalent, and in the mouth, pineapple, herbs, and a nice clean finish with a hint of acid made this a nice wine to sip on. The citrus and acid did a nice job of cutting through the rich flavors of the meal, but it was light enough to be enjoyed while the meal was cooking, especially on a warm day. While this certainly isn’t a ground-breaking Sauvignon Blanc, for around $10 it’s not a bad wine to pick up for a casual seafood dinner with your significant other. While you’ll see me drinking fewer of these wines as we head into fall (I’m a sucker for Sauvignon Blanc on the deck), we’ve still a few hot days left so try to get in some deck time with a crisp wine while you can. 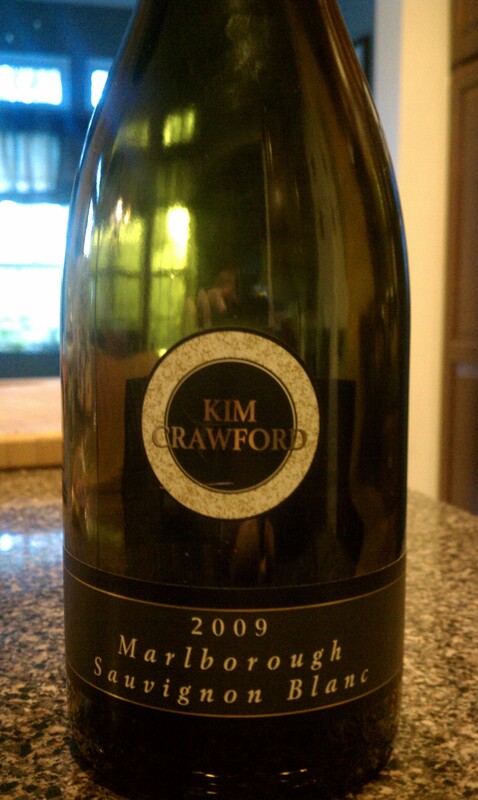 If you can’t find the 2009 Kim Crawford Sauvignon Blanc in a store near you, you can order it from here.